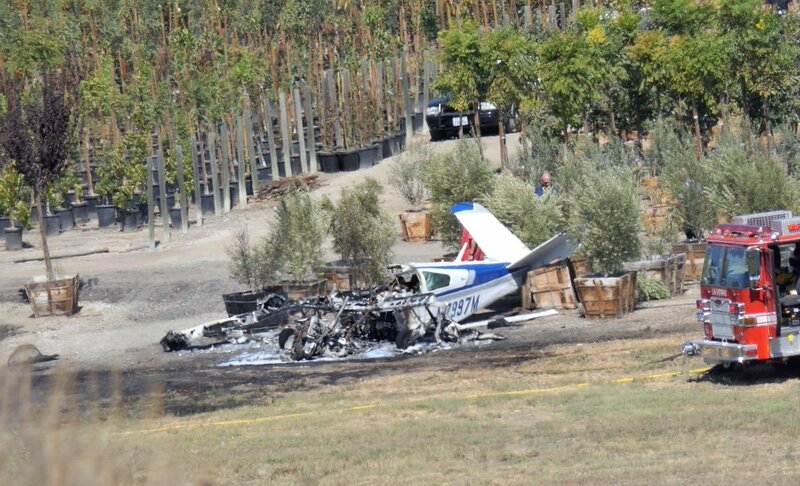 On October 1, 2018, about 1150 Pacific daylight time, a Beech V35 airplane, N7997M, was destroyed when it impacted terrain while on approach to landing at Brackett Field Airport (POC), La Verne, California. The private pilot sustained fatal injuries. The airplane was registered to and operated by the pilot under the provisions of Title 14 Code of Federal Regulations Part 91. Visual meteorological conditions prevailed, and no flight plan was filed for the personal flight. The flight originated from Blythe, California, about 1020, with an intended destination of POC. Preliminary information provided by the Federal Aviation Administration revealed that the air traffic control tower controller cleared the accident pilot to make a straight-in approach for runway 8R. During the approach, the pilot was advised by the controller about another airplane that was inbound for runway 8L, and the pilot was then cleared to land on runway 8R. Witnesses located near the accident site reported that they heard a noise and observed the accident airplane in a left bank that progressively continued to steepen before the airplane impacted the ground in a left wing, nose low attitude. The witnesses further reported that shortly after the impact, a post impact fire ensued. 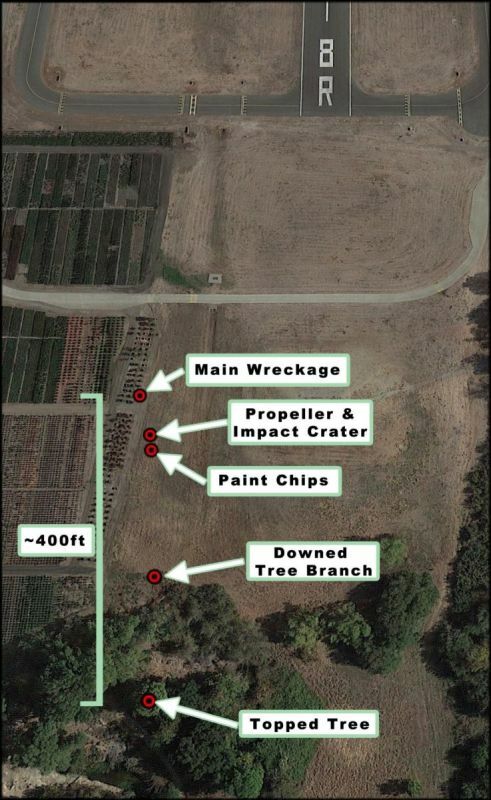 Examination of the accident site revealed that the airplane struck a tree, approximately 50 ft in height, about 900 ft from the approach end of runway 8R, and about 185 ft left of the runway centerline. The wreckage debris path was about 400 ft in length, oriented on a heading of about 070° magnetic. The forward portion of the fuselage and the inboard sections of both wings were mostly consumed by fire. All major structural components of the airplane were identified within the debris field. The wreckage was recovered to a secure location for further examination. Figure 1: The Accident Site in Reference to the Runway. A Beechcraft V35 Bonanza was approaching Brackett Field Airport when it crashed, with initial reports indicating it may have hit a tree, a Federal Aviation Administration official said in an emailed statement. A pilot who was nearby described what he saw. "I was the first one to land and I believe this pilot was the second one coming in," Steve, who was also flying into the airport on Monday, told KTLA. "Right when I exited the runway I looked to the right and saw big, black smoke and flames. So apparently it looks like he undershot the runway and landed short of the runway." The aircraft had flown to Catalina two days before from Brackett. It’s assumed that’s where he came from as he approached KPOC from the a West on a straight in. ATC recordings reveal runway assignment changes and confusion. Tower requested a go around because he was lined up for wrong parallel. I was mistaken about the plane coming from KL35. This is the 2nd fatal crash at Brackett in the last few days! A C177 crashed on 9/30.